No monolithic white hull and superstructure. No external staircases. No dining table in the main deck salon. No glass elevator dominating the central foyer. No long, straight hotel corridors leading to guest staterooms. Why? Because that’s how Cristina Gherardi Design of Paris, in cooperation with the owner, envisioned things on 274-foot (83.5 meter) Feadship Savannah—a yacht that transcends many design conventions, including being the largest hybrid-powered motoryacht launched to date. 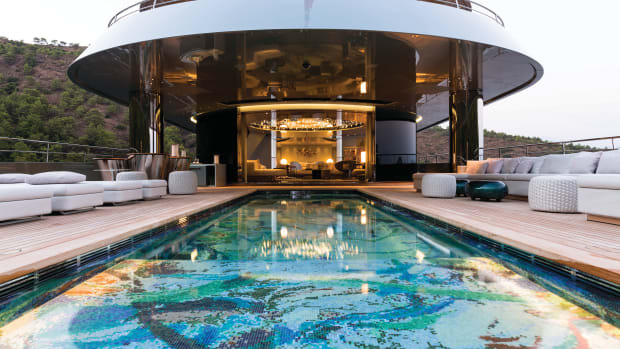 In addition to her sheer magnitude, exterior design, underwater lounge, sophisticated lighting scheme and hybrid propulsion technology, SAVANNAH is a standout for her imaginative interior layout and holistic design by Cristina Gherardi Benardeau and Marcello Bozzarelli of CG Design in Paris. 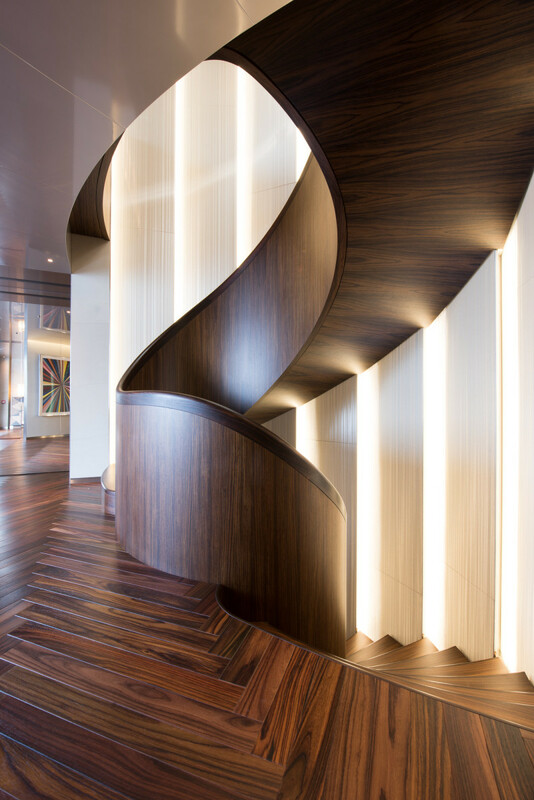 Pictured here, the winding central staircase exemplifies the yacht&apos;s contrast of simplicity and complexity, and the artistic use of light found throughout. Savannah is clad in metallic sea-foam-green paint from the top of her superstructure to her waterline, including her outdoor ceilings and fixed deck furniture. 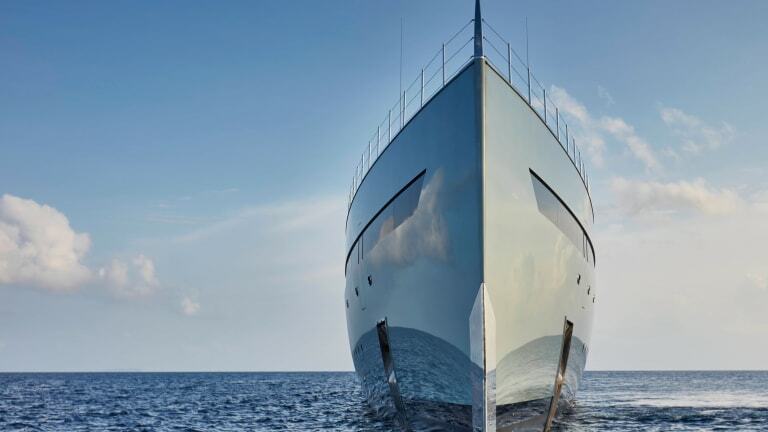 With her “full metal jacket,” according to Feadship, she is the largest object ever to have this metallic coating. The paint job enhances the cohesive, monochromatic profile by Cristina Gherardi Design. The brief also called for a “visually floating” superstructure in stainless steel and teak, and her upper decks appear to be suspended above the hull. Double-thick glass windows that appear black, without being reflective, establish the required uniform dark horizontal lines on each deck. The glass that wraps around each deck seems continuous without window frames. And where there are no windows, 48 custom, glossy, jet-black panels achieve design continuity. Other design features include extensive use of stainless steel. For instance, the exhaust columns are concealed in monolithic, raked stainless steel columns on the sundeck. They exit the hardtop looking more like sculptures than exhaust funnels. One reason Savannah is so singularly striking is that her designer’s specialty lies beyond yachts. Cristina Gherardi Design, founded by Cristina Gherardi Benardeau, draws largely on the principal’s experience in the luxury retail market. Gherardi earned her architectural degree from the University of Florence. An Italian national, she was the lead designer of retail spaces for Christian Dior, Kenzo and Virgin Megastores. Bouncing from Paris to New York to Milan and back to Paris, her forte was defining and creating new uses for historical buildings such as the Armani/Casa residential project on Wall Street in an old bank building. 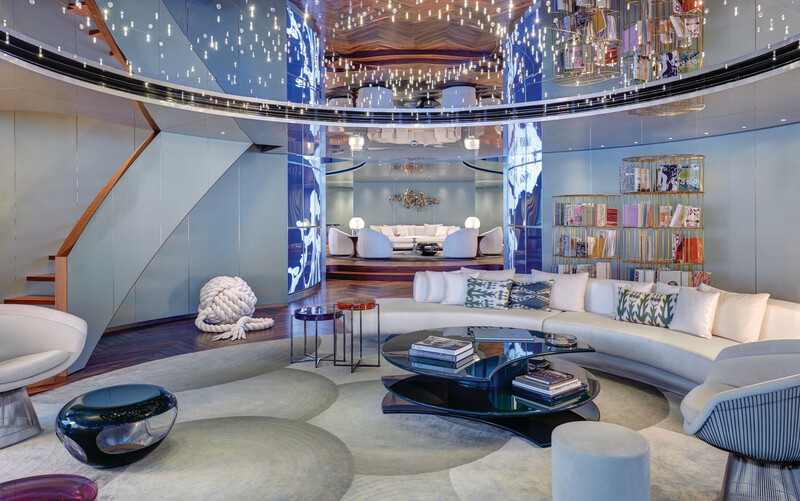 Without preconceived notions of how a yacht should look, Gherardi, in collaboration with architect Marcello Bozzarelli, created the overall look, carving the spaces, determining the lighting, designing and choosing the furniture, and dictating the finishes. 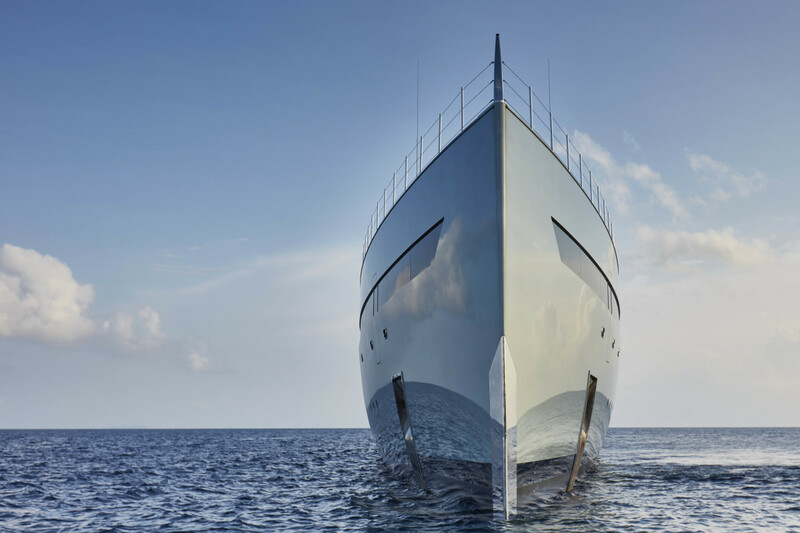 A powerhouse of energy, Gherardi pushed Feadship to achieve the maximum effect for her client—and Feadship expanded the boundaries of its own formidable skills in yachtbuilding. Savannah is clad in metallic sea-foam-green paint from the top of her superstructure to her waterline, including her outdoor ceilings and fixed deck furniture. 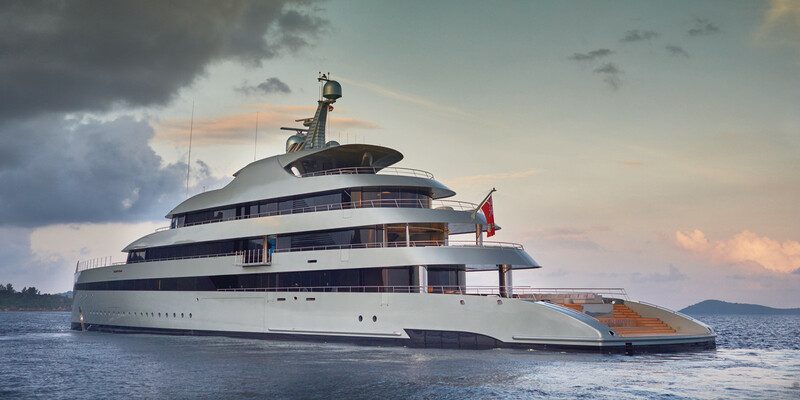 With her “full metal jacket,” according to Feadship, she is the largest object ever to have this metallic coating. The paint job enhances the cohesive, monochromatic profile by Cristina Gherardi Design. The brief also called for a “visually floating” superstructure in stainless steel and teak, and her upper decks appear to be suspended above the hull. 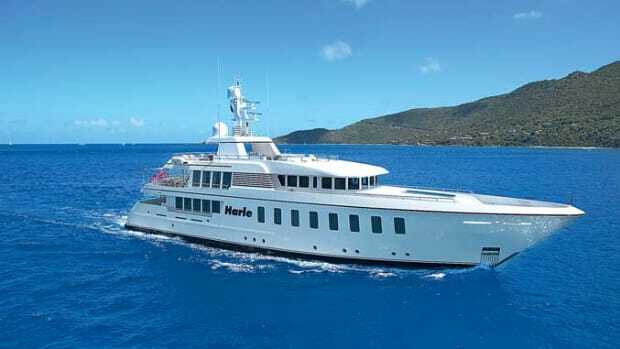 Gherardi joined the project because Savannah’s owner saw magazine photos of Giorgio Armani’s yacht, 164-foot (49.9-meter) Codecasa Mariu, and approached her. At the time, she was head of the Armani/Casa Interior Design Studio. 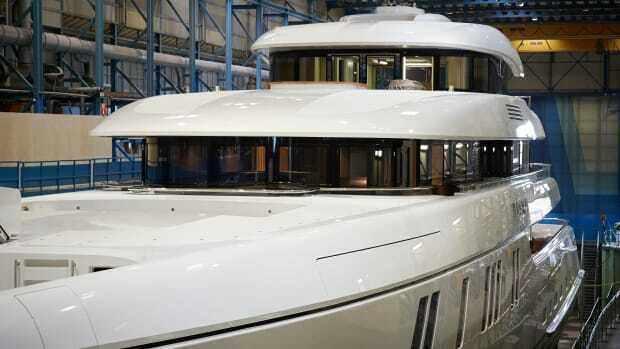 Her foray into the yacht world began with the owner’s first yacht: 160-foot (48.8-meter) Christensen Odessa in 2009. 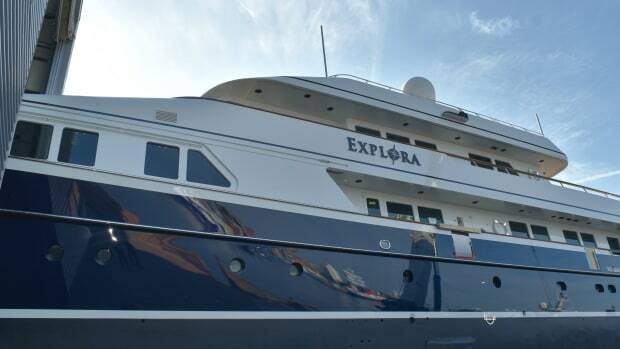 “The owner was not a yachting person per se,” Gherardi says. “He had chartered a Christensen and decided to build one.” Gherardi did the interior design work on Odessa, making some alterations to the general arrangement. Odessa went on to win awards (as has Savannah). When the owner decided to go bigger, he brought Gherardi with him to determine which yard could accommodate his program. 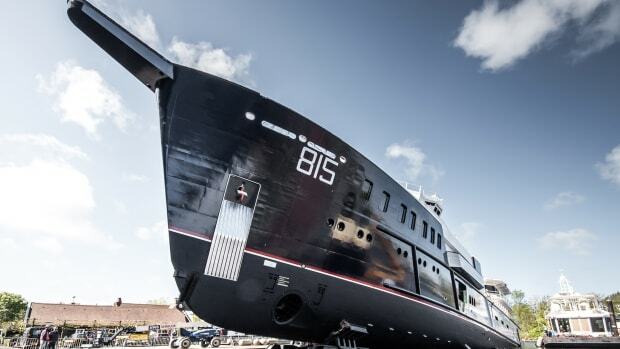 “In May 2011, we met with Henk De Vries [CEO of Feadship], and by the end of that year we signed a contract to build an 80-meter yacht from scratch,” Gherardi says. As the project evolved, it grew. The owner and Gherardi wanted the yacht to express speed and elegance. As she is now, Savannah has a remarkably slender waistline for her length: a mere 40-foot (12.2-meter) beam. In retrospect, Gherardi says, she would have liked a bit more length to allow for a more extensive foredeck and an even slimmer silhouette. 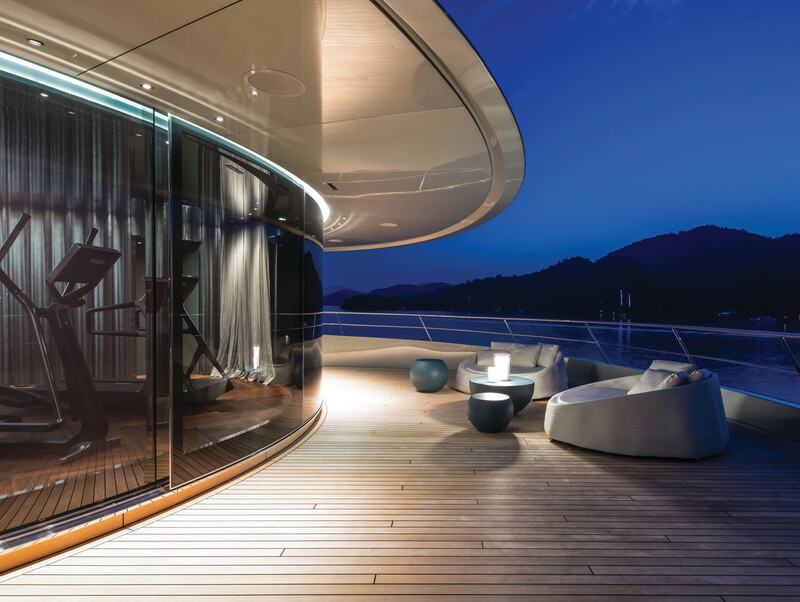 The curved glass at the after end of Savannah’s main-deck salon slides away to open onto a pool deck. The circular lounge is considered an outside area, not an inside living room. Another way to describe Savannah’s interior areas is visually compelling. The variety of materials and textures keep your head turning at every juncture. While the yacht is markedly contemporary, she cannot be pegged to one design style. The interior is an eclectic mix of name-brand designer items, art and furniture procured from flea markets and elements that Gherardi’s firm created. She incorporated iconic chairs from the ’60s and pieces from other eras simply because her team liked them. Savannah’s design also includes common areas with views of or access to the outdoors. Living areas on the main deck, bridge deck and sundeck all are meant to exist in harmony with the sea. Windows and balconies contribute to the success of this concept. Even the gym is open; situated on the bridge deck, it is yet another room with a view. Savannah’s design also includes common areas with views of or access to the outdoors. Living areas on the main deck, bridge deck and sundeck all are meant to exist in harmony with the sea. Windows and balconies contribute to the success of this concept. “We are not snobs about these things,” Gherardi says. What they did not buy, collect or curate, Gherardi and Bozzarelli designed, such as a dining table made from straw; a chandelier with tubes of light rather than crystals; and silvered-glass dressers in the staterooms. In a major departure from convention, there are no straight corridors anywhere in the guest spaces. All of the companionways are instead slightly curved and sculptural. A curved red hallway differentiates the master suite, which begins at a study. The forward-facing bedroom has a panoramic view with outside access through pantograph doors. The master suite is an uncluttered space with onyx bathrooms and no doors, except at the entrance to the bedroom, which has a curved fireplace with electric candles for ambience. 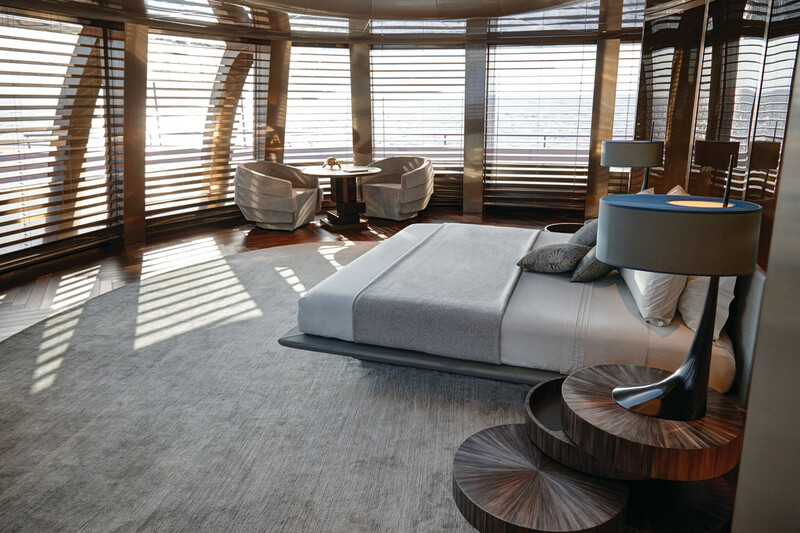 The forward-facing master stateroom has a panoramic view with outside access through pantograph doors. The master suite is an uncluttered space with onyx bathrooms and no doors, except at the entrance to the bedroom, which has a curved fireplace with electric candles for ambience. 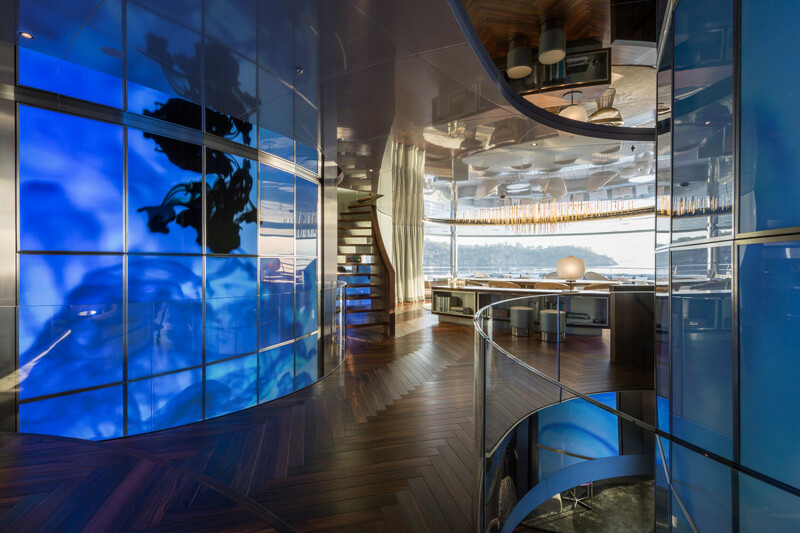 On the main deck forward past the spiraling stairway, another curvilinear hall leads to a VIP suite with a private balcony, and to four guest staterooms made spacious by mirrored ceilings and showers with an outside view. Cristina Gherardi Design had the bathroom marble cut to follow the grain, instead of wasting the precious material by trying to bookmatch it. Custom dressers from Cristina Gherardi Design add richness. Designed by Cecily Brown, the 30-foot-long main-deck swimming pool is custom tiled in a variety of blues and greens, forming an eye-catching abstract work of art. This pool deck is flush to the main salon, enhancing the flow between inside and out. 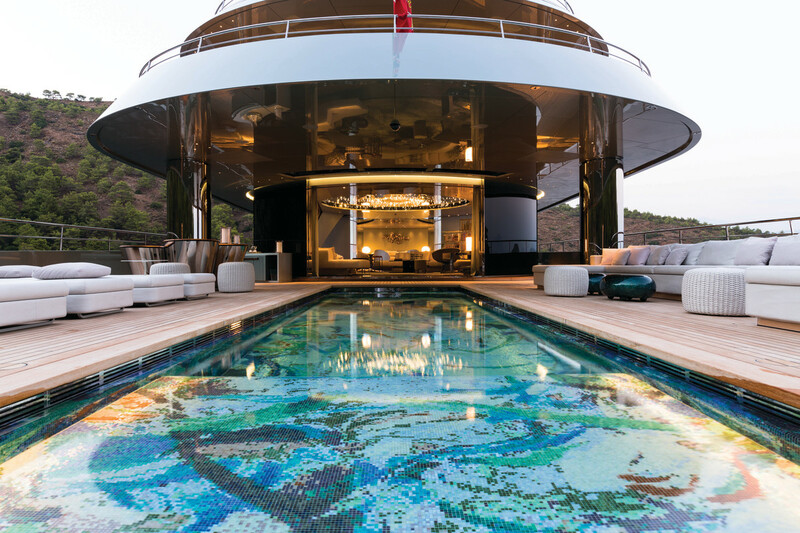 The main deck aft has a pool that’s 30 feet (9.1 meters) long and inlaid with an abstract mosaic painting. From there, you enter the “outside/inside” salon. Twin video screens, each 16½ feet (5 meters) tall, flank the catwalk between the aft and central lounge areas, creating a focal point. The screens run loops of abstract underwater scenes including reef fish and jellyfish. Gherardi used this type of digital art in retail spaces she designed for Christian Dior. The owner originally entertained the idea of an aquarium, as he had on Odessa, but the digital display does not require feeding. Adding to Savannah’s long list of unique and stimulating design features is an “underwater” room called the Nemo Lounge. 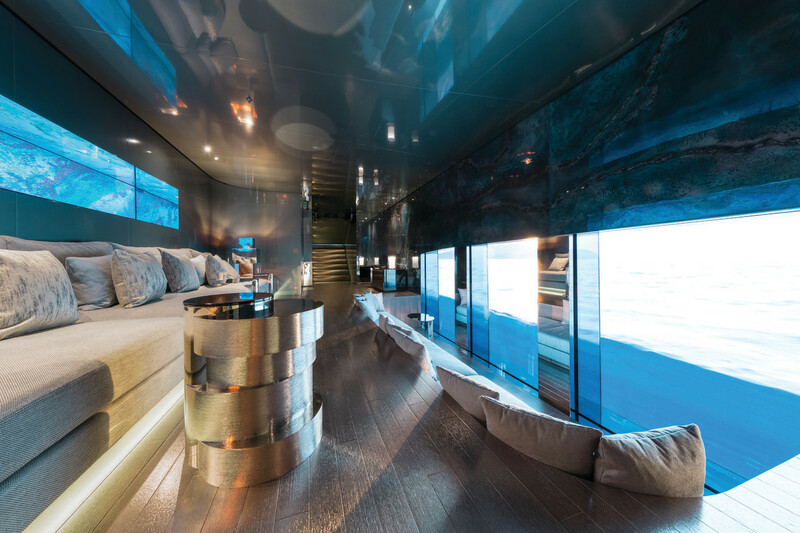 A thick glass wall in the hull allows guests to settle in for a real-time view of what is transpiring both underwater and above. Stadium seating and a drop-down cinema screen can turn the outside view into a theater experience. Savannah is full of surprises. She is also full of firsts. Refreshingly unique, Savannah is a yacht that sets a new bar for the design and execution of superyachts. Approximately 200 paint samples were prepared before meeting the owner’s approval. Painting Savannah necessitated 46 personnel: 21 spray painters, 21 assistants, three managers and one paint maker. They would spray a particular section of the hull and superstructure in a single day, always heading in the same direction. They started at 5 in the morning and worked for as long as it took to ensure every part was painted in exactly the same way without using tape lines. The painters worked in a climate-controlled tent spanning some 794,580 cubic feet (22,500 cubic meters). They used special mixing machines and, for the first time, electrically charged spray guns for consistency in the metallic flakes and to achieve the thickest possible layer. In total, they covered a surface area of 34,445 square feet (3,200 square meters), using some 317 gallons (1,200 liters) of paint along with 500 gallons (1,900 liters) of clear paint. Because metal interferes with reception, the mast domes were finished in pearl paint to achieve the same aesthetic effect as the metallic paint. A hybrid drivetrain is one that uses two or more distinct power sources for propulsion—usually diesel engines and electric motors—that can be used together or individually. Unlike a pure diesel-electric system, with diesel generators producing electricity that is transmitted via flexible cabling to electric propulsion motors, in a hybrid system there is always a direct mechanical connection between the diesel engines, electric motors and propellers. 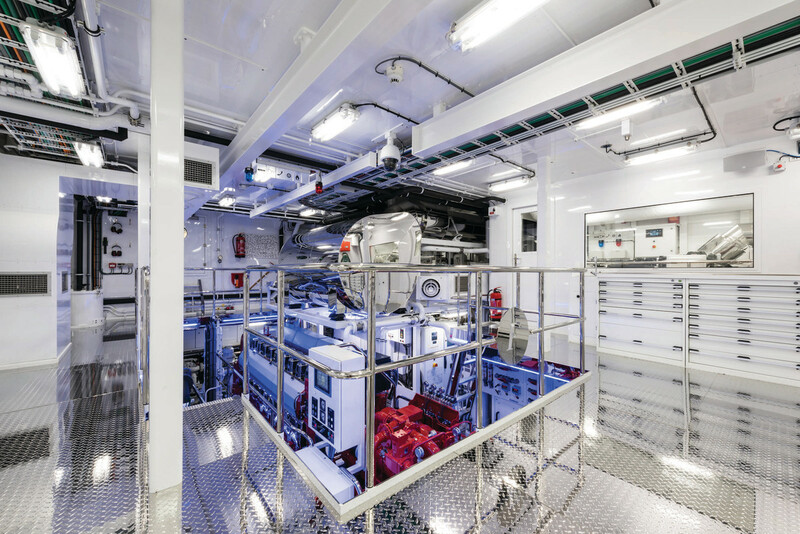 The hybrid system aboard Savannah comprises a medium-speed Wärtsilä diesel engine driving a single controllable-pitch propeller via a gearbox. Abaft this main propeller is an azimuthing, electric stern thruster that can be used for both propulsion and maneuvering. In addition to three Caterpillar diesel generators for electrical power, the gearbox is connected to an electrical generator-motor via a PTI/PTO (Power Take In/Power Take Off). As a generator this can provide the complete hotel load, avoiding the need to run the diesel generators; as a motor it provides electrical power to drive the main propeller. Furthermore, two Li-ion battery banks can be used in combination with the other power sources to act as buffers during spikes in demand before the generators start up, or to avoid blackouts if the shore power drops out. This hybrid configuration provides five distinct operational modes that can be selected depending on circumstances and the desired speed. In maneuvering mode, the three generators provide electrical power to the stern thruster and for the hotel loads. In diesel-electric mode for speeds up to about 14 knots, the generators drive both the main propeller via the PTI/PTO on the gearbox and the stern thruster. In range mode for a predicted range at 13 knots of up to 6,500 nautical miles, all power to drive the main prop is generated by the Wärtsilä engine, and via the PTI/PTO for electrical power to the stern thruster and the hotel load. In high-speed mode for a predicted top speed of 17 knots, the generators supply power for the stern thruster and hotel loads, while the Wärtsilä engine provides mechanical power to the main propeller. Sprint mode is like high-speed mode, except that if the hotel load reaches the maximum capacity of the generators, the battery banks can cut in to provide an extra 500 kilowatts for up to two hours. The Rolls-Royce Azipull stern thruster is a key feature of the drivetrain. Conventional propellers cause circulations in the water that result in energy loss. Contra-rotating propellers (two propellers placed one in front of the other that rotate in opposite directions) neutralize these circulations and create more forward thrust. This means a smaller main engine can be installed, leading to lower fuel consumption and emissions. Because a single large propeller mounted on the centerline with fewer struts and appendages has less resistance than a twin-screw hull form, hull efficiency is also enhanced. 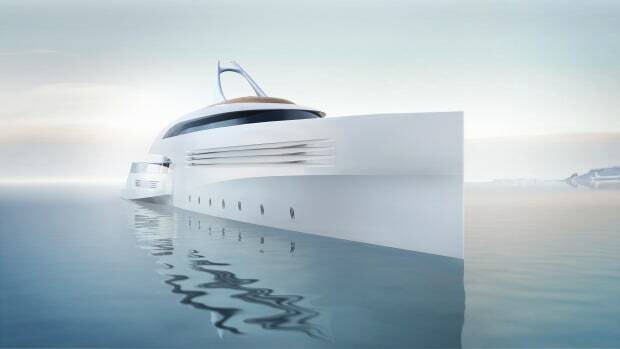 When this setup is combined with the medium-speed diesel engine, Feadship says, Savannah should burn up to 30 percent less fuel than a conventional yacht of similar size. Savannah’s hybrid setup was introduced in 2004 on two fast ferries built in Japan. 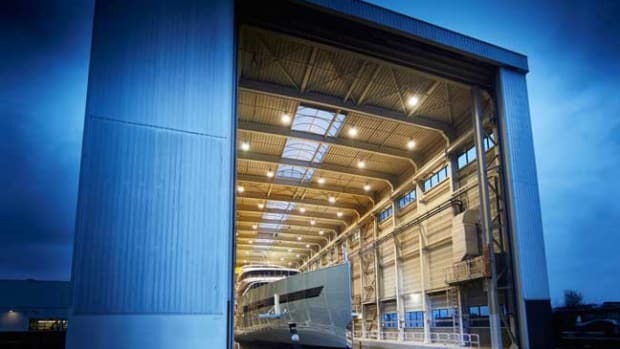 Feadship engineers traveled to the country as part of their R&D program. The system clearly provides high levels of flexibility and redundancy. If the main engine, gearbox or main propeller fails, the yacht can be driven and steered with the azimuthing stern thruster. If the thruster fails, the yacht can likewise be driven by the main engine and propeller and steered with the two rudders. 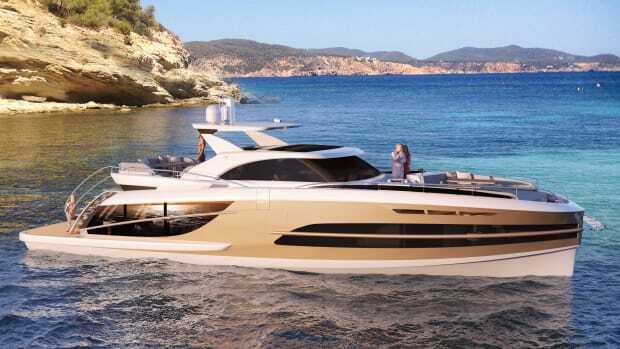 But arguably, the main attraction from an owner perspective is the prospect of quieter cruising. The load on the single variable pitch propeller, which is up to 40 percent bigger than the norm, is half that of conventional twin screws. Together with the smaller main engine and electric Azipull, this means less noise and vibration in all navigation modes.